You guys are always asking about Rihanna’s rings and I try my best to please. 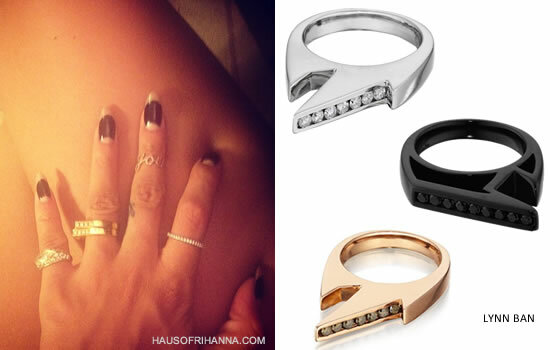 Recently Rihanna has been wearing two gold and diamond rings on her ring finger. These rings are from jewellery designer Lynn Ban. The stackable Jagged rings come in varying shapes and are currently available online in two finishes: sterling silver with white diamonds and rhodium with black diamonds. FYI Rihanna’s nails were done by Jenny Longworth.